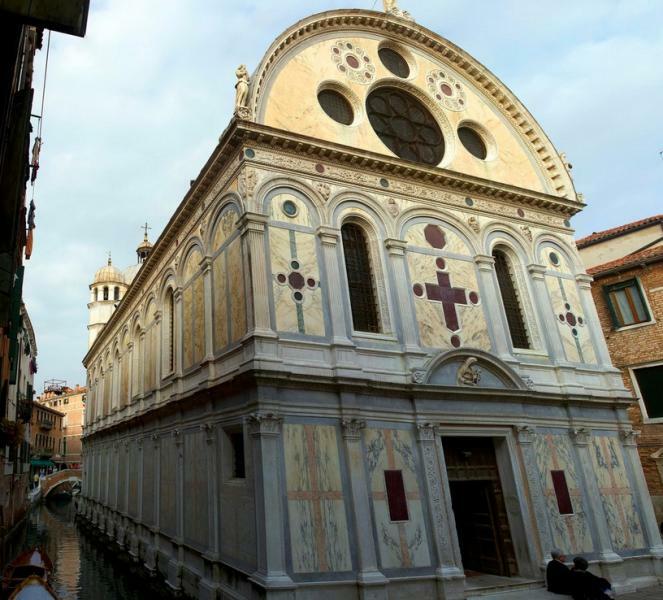 A jewel in Venice’s Renaissance crown, this church was built around a popular wonder-working painting of the Madonna and Bambino that once had a shrine in the neighbourhood. It received enough donations to afford a proper, if small, church to shelter it, and one was designed by Pietro Lombardo and his sons, Tullio and Antonio, in 1481–9. But the real miracle is the church itself – the perfect expression of Venice’s half-archaic brand of Renaissance, bending the classical laws to its own decorative ends. With a façade topped by a Mauro Codussi-style semi-circle crowning, the church is covered inside and out with a pearly sheath of rich marbles like St Mark’s – one tradition says that it got all the leftovers. The Lombardi embellished it with their trademark discs and geometric designs in porphyry or green serpentine marble, not to mention some of the most masterful stonecutting in Venice, beginning with the angels on the façade, believed to be by Pietro Lombardo himself. The luxuriant marble and porphyry clad interior is perfectly proportioned, and left untouched since the day the Lombardi put down their chisels; the pale marbles are so finely veined they resemble Chinese pen and ink landscapes.The miraculous painting (by Nicolò di Pietro) is still in place, and on either side of it are the only post-Lombardi additions: bronze statues of SS Peter and Antony Abbot, by Vittoria. The raised choir and altar, with stairs leading to a small crypt, is an anachronistic feature, common in medieval churches throughout central Italy but surprisingly rare in Venice, where it is the only way to have a crypt at all, or at least one above the water line. Have a look at the barrel-vaulted ceiling, decorated with 50 fine Renaissance portraits of the prophets and other Old Testament figures by Pier Maria Pennacchi. Don't miss the exquisite carving on the pillars of the barca, or nuns’ gallery, at the entrance, where the sculptors’ fancy was given free rein to frolic among the delightful motifs of a Renaissance spring. These gallery carvings are attributed to the three Lombardi; the statues on the balustrade in front of the raised altar are by Tullio, and the reliefs of children and mermaids under the great arch are believed to be by Antonio. The church appears in the wedding scene of Othello and Desdemona in Orson Welles' film of Othello (1951). Also see Around Santa Maria dei Miracoli. Santa Maria is a Chorus association church.